“As the largest single consumer of energy in the world, the US Department of Defense (DoD) is one of the most important drivers for the cleantech market today,” says Pike Research. While the US continues to drag its feet on climate change in terms of national emissions legislation, its armed forces have been investing in renewable energy – on a very large scale. According to Pike Research, part of Navigant's Energy Practice, the total capacity of US Department of Defense (DOD) renewable energy installations will quadruple by 2025 – from 80MW in 2013 to more than 3200MW by 2025. In fact, this is not a new development. According to a report by the Congressional Research Service energy specialist Anthony Andrews, Congress began mandating reductions in energy use by federal agencies back in the early 1970s. This was to be achieved by improving building efficiency and reducing fossil fuel use. This was followed by President Obama's Executive Order of 2009 – mandating a 30% reduction in energy usage and other measures by federal agencies. 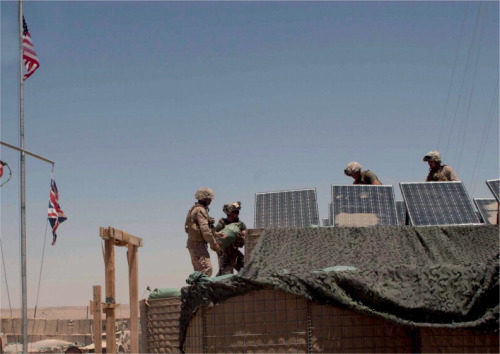 Later, Net Zero, a 2010 policy introduced by the Army Energy Programme, decreed that on-site operations should use energy produced on-site, leading to use of solar at forward bases in Afghanistan, for example. In a related defence development, the Defense Advanced Projects Agency (DARPA) has been looking into renewable jet fuel. Net Zero, similar to other military policies, is driven not by concern about climate change or green jobs but by the need for energy security – and fuel economy. While Net Zero is an army initiative, the other service branches, the US Air Force, Navy and Marines all have their own programmes and targets. In fact, military involvement in renewables should be seen as two separate but connected strands: efforts directly funded by government, usually via contracts with defence contractors, and independent efforts by the defence and aerospace industries, which depend on the armed forces' procurement offices. Meantime, and very importantly for our sector, it is not just defence industries. Some solar firms are in the picture, such as Solar City, which lists “military” among customer categories on its website, along with building companies and utilities. For example, late last year the US Army launched a major solar project for up to 4,7000 military homes at Fort Bliss, Texas, and the nearby White Sands Missile Range in New Mexico, with Solar City and Balfour Beatty Communities LLC, part of Balfour Beatty plc, as partners. This is a 13.2MW project, part of Solar Strong, Solar City's five-year plan for more than $1bn in solar projects for up to 120,000 military homes throughout the US. Local utility El Paso Electric is currently in discussions on the Fort Bliss and White Sands projects. Importantly, the various US directives have stimulated innovation. For example, the US has a Defense Innovation Marketplace – and this should not come as a surprise. We all know that we owe the internet to early US military efforts. Given the large sums involved, US military commitment to low carbon could be very good news for our sector.